Ireland’s total contribution to the international humanitarian response in Syria is almost €14 million. 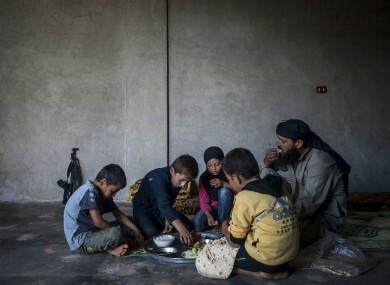 Ahmed al-Fikri sits with his sons and daughter, among them 12-year-old Abdo al-Fikri, second left, to eat lunch at their family house in Madaya village after school in the Idlib province countryside of Syria. AN ADDITIONAL €3 million in humanitarian funding towards the Syrian conflict has been announced today. This brings Ireland’s total contribution to the international humanitarian response to almost €14 million. The Minister for Trade and Development, Joe Costello said it is essential that the overwhelming humanitarian needs both in Syria and across the region are met. He said Ireland’s contribution is a reflection of the unprecedented scale of the crisis and the enormous demands on humanitarian agencies and neighbouring states. “It further demonstrates Ireland’s commitment to play a leading role in the global response to this crisis,” said Costello. The minister is currently in the Lebanese capital of Beirut, where he is visiting a camp hosting some of the 780,000 refugees who have fled to Lebanon since the outbreak of violence in Syria. The €3 million will benefit those directly affected by the conflict and the communities in Lebanon and in other neighbouring states, said the minister. A third of the €3 million funding announced will be directed to UN agencies in Lebanon. The UN High Commissioner for Refugees has described the conflict in Syria as the worst humanitarian disaster since the end of the Cold War. Almost 7 million people require urgent assistance to meet their basic needs. More than 2 million people have fled to neighbouring countries. Costello added “with a similar population to Ireland, this gives some idea of the enormous pressure on its social services and infrastructure. Yet despite this, Lebanon has kept its border open to Syrian refugees. The funding I have announced today is Ireland’s contribution to helping Lebanon and other neighbouring states shoulder the burden of such large refugee numbers”. Email “Ireland to give an additional €3m in humanitarian aid to Syria ”. Feedback on “Ireland to give an additional €3m in humanitarian aid to Syria ”.